The best series. The best creators. The best publishers. After five years turning a discerning eye on the comic industry, the Ninth Art team present nine awards recognising the absolute best of the medium from the lifetime of the site. Every week, Ninth Art's writers have nominated their picks of the best comics on the shelves. Every month, Ninth Art has offered advice on the best comics to order. Every year, Ninth Art has shared its opinion on the best comics, creators and accomplishments of the past five years. Now, with the site closing down, Ninth Art's team of critics has taken a look back at the comics produced throughout the five years of the site's existence, to find the comics and creators that have represented the very pinnacle of the ninth art. There are nine awards, and no runners up - just the best of the best. WE 3 doesn't initially sound like the sort of story that would find itself critically lauded above all its peers in end-of-website articles. It's a three-issue mini telling the simple story of three animals turned into killing machines by a military program, before escaping. The Incredible Journey meets the Terminator. When you hear it's by Grant Morrison (probably the most publicly acclaimed writer currently working in the mainstream) and Frank Quitely (probably the most publicly acclaimed artist currently working in the mainstream), its chances rise. Perhaps they can elevate the base subject matter to something higher? In the end, they elevate it to such a height that if you placed someone on top of it, DC comics would have their own personal space program. Where to start? It's a grand formalist play, with panels fragmenting, exploding, freezing and rotating to best display the detail of the effect of ultra-budgeted military weapons on all too weak flesh. Then there's Morrison's painfully effective simplified dialogue structures and emotions for the animals ("IS GUD DOG?"). And there's its none-too-subtle political point on animal testing (even if you don't agree with it, great art is capable of making you wish you did agree, and WE 3 manages that exquisitely). And perhaps most crucial of all, for a comic that's so brutal and so short, it's impressive the number of people it's made cry at different points. It has a heart. It has a brain. 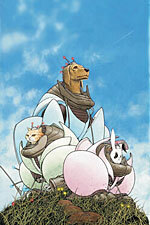 It has a cat, a dog and a rabbit annihilating masses of US army troopers in quite frankly brutal Frank-Quitely-o-vision. It's the best, most imaginative, most innovative action comic in the Western medium in the time Ninth Art has been in existence. But what makes it truly great is its realisation that simply being the best, most imaginative, most innovative action comic in the Western medium isn't enough. It's a comic that reaches farther. 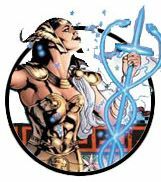 PROMETHEA began as more of the same sort of pastiche that Alan Moore had played with on Rob Liefeld's SUPREME. Indeed, many of the ideas that appear in the series were originally meant for SUPREME's sister title GLORY. But as the series progressed, PROMETHEA moved beyond its post-modern fantasy roots to become a full-blown treatise on the nature of magic and reality, as mediated by our relationship with fiction. PROMETHEA is comprised of three main arcs: Initiation, Education, and Revelation. First, student Sophie Bangs becomes the latest in a long line of walk-in hosts for Promethea, while writing a dissertation of her own on the subject. Through her, we see Moore define his terms, laying down the metaphorical foundation of his thesis. Next, Sophie leaves the real world behind, exploring the philological underpinnings and leitmotifs of the Universe in the form of the Kabbalistic Tree of Life. Finally, student becomes teacher as Sophie returns to Earth, reluctant to pass on what she's learned, but ultimately fulfilling the promise of her alter-ego's name in doing so. In PROMETHEA, Messrs Williams, Gray and Villarrubia blended artistic styles from Impressionism to fumetti to create a rich, layered backdrop for their intellectual pursuit. Experimental storytelling of the rarest, most potent kind made each issue a treat, without once compromising Moore's singular vision. Philosophy - real philosophy, as opposed to dime store hokum - is a woefully underrepresented genre in comics. And while some people found the stentorian tone of PROMETHEA off-putting, as if they resented being lectured by their entertainment, most appreciated the series as articulate, affecting, occasionally sweet and often terrifying - the ultimate avatar of the medium in its present form. 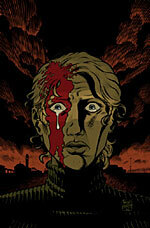 Author Greg Rucka was already known for his thrillers when he broke into comics with the excellent WHITEOUT. Several successful DC comics later, he returned to Oni with QUEEN & COUNTY, an ongoing series chronicling the adventures and self-destructive indulgences of Tara Chace, a British 'minder' - a secret agent without the Bond-glamour. Less Modesty Blaise than Helen Mirren, Chace's adventures, illustrated by a different artist each arc, gave Rucka perhaps the best showcase for his writing. Comics let him visually illustrate the internal conflict that drives much of his novels, and his often frightening levels of research give him an endless pool of stories. It was grim coincidence that led to the book's second arc, dealing with the Taliban, coming out in the wake of 9/11, while the novel A GENTLEMAN'S GAME opened with a terrorist attack on the London Underground. It's not unusual for fiction to reflect current events, but Q&C is so invested in the real world that it actually manages to anticipate them. The series has been on a regrettable hiatus until recently, though that period saw the series take an unconventional swerve into prose with A GENTLEMAN'S GAME and PRIVATE WARS. Now the series is back in its native medium and catching up with the novels with a new arc illustrated by excellent newcomer Chris Samnee. As we watch Tara deal with the latest changes in her life, we know that 'the game' is what truly gives her purpose. It leaves her body beaten and her soul distraught, but by God, she's good at it. And though she's as doomed as every other minder who's gone down over the course of the series, we still can't look away. The QUEEN & COUNTRY story is hopefully a long way from finished - and we're optimistic that it will be just as compelling in the future as it's always been. Rucka and his collaborators have created a long-running series that boasts both real intelligence and dramatic integrity. There aren't many newspaper strips or panel cartoons that will go down in comics history as truly well-respected and important works. PEANUTS is one, THE FAR SIDE is another. CALVIN AND HOBBES, Bill Watterson's series of insights into the lives of a boy and a big cat, is undoubtedly another, and last year Andrews McMeel gave fans of the strip - and fans of comics in general - a wonderful gift in the form of THE COMPLETE CALVIN AND HOBBES, a hefty slab of hardback boxed goodness collecting the strip in its entirety. The reasons CALVIN AND HOBBES is so well-loved are many, but most boil down to the central relationship in the book; that between a boy and his stuffed tiger. At its core, the strip is about friendship, that much is clear. But it's also about acceptance. Calvin is not what you would call an easy kid to live with. Everyone else in the strip thinks he's a distinctly odd little fella, and with his wildly out of control imagination, it's not hard to see why. Hobbes, though, simply regards Calvin's flights of fancy as the norm. He's willing to take Calvin, mad peccadilloes and all, as his best friend, and Calvin is willing to do the same for the tuna-obsessed big cat. Calvin's parents and teachers, they only get to see one aspect of his multifaceted personality. Even Susie, who, by dint of being the only kid who will talk to Calvin, is his de facto best 'real' friend, really only interacts with him as the straight man to his bizarre flights of fancy, or as the target of one of his many water balloon/snowball attacks. Hobbes is the only person who gets to see the whole Calvin. The only one who gets the benefit of his unbridled imagination, his restless sense of fun, his inventiveness, his truculence, his mean streak. Likewise, Calvin gets a friend in Hobbes who is vain, sweet, annoying, protective, lazy, and a willing partner in crime. Calvin and Hobbes are a single unit; Calvin divides the world up into 'us' and 'them'. Hobbes is the only one who gets to join Calvin as one of 'us'. I'm making it sound a little sappy here, but at its heart CALVIN AND HOBBES is a comedy. It's equal parts stupid pratfalls, ridiculous alter-egos juxtaposed with prosaic reality, and smarter situational and language-based gags. It's one of the few comic strips that manages to be laugh-out-loud funny - when was the last time GARFIELD could claim that? The box set isn't cheap. But it's an investment that will pay you back tenfold with every page you read. There's treasure everywhere, as Calvin so joyfully said. There's certainly treasure here. Most creative debuts are the sort of thing that you want to forget about. It's understandable, really. It's your first shot out of the gate, you're eager and ready to try and use every trick in the book, and the reality is that you don't understand the majority of them. That's all right, though, you're going to (hopefully) get the hang of things and improve with time. That on some level is what makes the FLIGHT anthology's debut stand out so much. This was the big first step for most of the creators involved, and it wasn't something that you'd look at and think, "Just wait; in five years..." No, this was a book that felt like it was created by seasoned pros who'd been around for decades. Wait, that's not fair. A lot of seasoned pros never get this good, and, more importantly, never offered the levels of energy and excitement contained in the pages of FLIGHT. Images practically explode off the page at the reader, challenging you to try and turn away. It's a visual and creative delight from start to finish, the first volume some 200-odd pages of full-colour fun. And then, a year later, in an attempt to prove everyone wrong, a second volume showed up, twice as long and twice as good. To have something this good once is having the proverbial lightning strike. Twice? That's not chance, that's skill. A third volume of FLIGHT is scheduled for release this summer, and I have a feeling it's going to thrill and excite everyone all over again. Some people have to learn to fly step by step. The FLIGHT creators were airborne at the first attempt. Five years ago, not many people knew who Bryan Lee O'Malley was. Among the few who did, he was best known for almost drawing Brian Wood's COUSCOUS EXPRESS; almost doing covers for Marvel's NYX; and almost finishing the web comic STYLE. 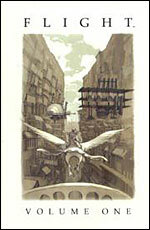 O'Malley had a great eye, a fluid brush stroke, and a feel for the language of comics. But besides occasional acoustic song recordings, he couldn't seem to finish anything. Fast-forward to 2004, and lots of people found out who Bryan Lee O'Malley was. He was that SCOTT PILGRIM guy! The awesome, video-gaming-obsessed, manga-crazy cartoonist dude whose comics will blow your mind! He's going to do six volumes, man! And the train kept a-rolling, from the sleeper success of SCOTT PILGRIM itself, to the sale of movie rights to SHAUN OF THE DEAD culprits Wright and Pegg, to the enormous continued sales of the sequel volumes. It seems the world has officially gone PILGRIM mad, and it likes it that way. Of course, the truth is that a lot of time and hard work went into O'Malley's rise to stardom. His first major comics debut was on Jen Van Meter's HOPELESS SAVAGES, which he quickly followed with the graphic novel LOST AT SEA before diving into the multi-volume SCOTT PILGRIM. And he lettered hundreds of pages of other people's comics, biding his time and churning out his own web comics until he felt ready. Over the past two years, he's proven ready to finish what he started. And now everybody knows who Bryan Lee O'Malley is. He's the best new talent to break through in the last five years. 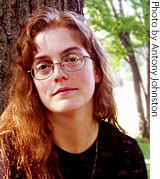 Carla Speed McNeil first appeared on many people's radar after being mentioned in one of Warren Ellis' columns. Scott McCloud was an early admirer too, calling her comic, FINDER, "the best comic you've never read". McNeil calls FINDER "aboriginal SF": it's an exercise in world-building that, even underneath the weird sci-fi trappings, shows far more thought-out realism and humanism than most comics. McNeil has poured so much detail into her world (not to mention each individual panel) that the mind boggles at the scope of it all. It's a good thing the collected editions have lengthy footnotes, detailing the histories of clans, towns, people, and all the little cameos and pop culture references that litter nearly every square inch. Of course, these are things that you don't need to know to enjoy FINDER - but they make rereading it all the more enjoyable. As if McNeil's ability to write a range of situations - from kitchen sink melodrama, to alien cultures like a group of humanoid lions - isn't enough to admire, her ability to illustrate it all, and more, is utterly stupefying. And thankfully her line work has graced work outside of FINDER, with an arc in QUEEN & COUNTRY, and the sold-out Apparat book FRANK IRONWINE, where she gave the archetypal grizzled Warren Ellis character a haunting, believable humanity. McNeil is still working on FINDER (there are seven volumes and counting), and has taken the pioneering step of moving publication of the individual issues off the page and onto her website, where they can be read for free. (The storylines will still be collected in trades). Her dedication to creating and developing the FINDER mythos and the obvious talent she displays in pretty much everything she does are an inspiration. For all the recognition she's received thus far, she deserves to be still more widely appreciated. Given that this is the last Ninth Art update, let's take the opportunity to make some wild and inaccurate prophecies about the future. My prediction is this; in five years time, every comic book publisher is going to adopt the Tokyopop business model. The spectacular success of Tokyopop had taken many mainstream comic publishers by surprise. It wasn't so long ago that Japanese comics were considered a niche market, unworthy of exploiting - and now that they've missed the boat, all the mainstream publishers can do is glare enviously at the massive sales figures. Some argue that it's just a fad, the print equivalent of Pokemon or Tamagotchi, and the bubble is going to burst any minute now. They think it's got nothing to do with the business of making 'proper' comics. How wrong they are. Mainstream comic publishers are like dinosaurs blinking at a meteorite crackling through the sky. Its smoke trails are spelling out the letters M-A-N-G-A, and it's the last thing they'll see before they're obliterated. A new breed of comics publisher has emerged, and Tokyopop has led the way. The new breed won't necessarily all publish manga, but they'll be using the same tactics. They're going to sidestep the direct market ghetto and go straight to the bookstores; they're going to publish in black and white, and offer comics at a low price point; and they'll vie for the attentions of a broader audience beyond fanboys and schoolgirls. In short, the new publishers are going to be everything that the current publishers are not. It's not about being a publishing behemoth and dictating what stories the drones can read; it's about being small and nimble, and quickly adapting to whatever opportunities come your way. The rule of the market is change or die, and no one has proved this more assertively than Tokyopop. Their outstanding achievement over the past five years has been to build a new comics audience and create a new publishing model even as the old warhorses crumble and die. Long may Tokyopop continue to prosper. In the spirit of full disclosure, we should admit: The editors at Ninth Art are friends with many of the staff and creators at Oni Press - and, of course, Ninth Art's Antony Johnston has worked with them extensively. But that's not why they've won this award - in fact, they won it without needing any help from our editors. But we laud them as the best publisher in our lifetime for much the same reason that we get on so well; Ninth Art and Oni Press see eye to eye. We've never had a manifesto here at Ninth Art, but there are certain beliefs we hold dear. We believe in the strength of good stories. We believe in the medium's potential for diversity and originality. We believe that comics shouldn't be held hostage to mainstream publishers who squander that potential. We believe the best hope for the future is to find and nurture new voices who can offer up new ideas. We believe in art. We believe in entertainment. We believe that comics should be taken seriously - and enjoyed frivolously. For the last five years, Joe Nozemack, Jamie S Rich and James Lucas Jones have done more than any other publishing house to put out the sort of books and nurture the sort of talents we want to see, with an ambition that's only been limited by their resources. They've provided a home for brilliant cartoonists like Andi Watson, Colleen Coover, Mike Allred, Hope Larson, Sam Kieth, J Bone and Scott Morse. They've introduced us to COURTNEY CRUMRIN, BARRY WEEN, SCOTT PILGRIM, ALISON DARE and the HOPELESS SAVAGES. They've launched the careers of artists as different as Brian Hurtt, Corey Lewis, Ross Campbell, Christine Norrie and Leandro Fernandez. They've given us CAPOTE IN KANSAS, FORTUNE & GLORY, LOVE AS A FOREIGN LANGUAGE, OFF ROAD, BLUE MONDAY, THE COFFIN - and, of course, QUEEN & COUNTRY. We called this site Ninth Art because it's a term that places comics in a noble lineage of creative expression. It's a term of respect that many modern comics don't always live up to. At Oni Press, they create comics that earn that respect, and deserve to be called 'the ninth art'. So, we admit it; we like Oni Press. The Ninth Eight are Matthew Craig, John Fellows, Kieron Gillen, Alistair Kennedy, Zack Smith, Andrew Wheeler, Ben Wooller and Bulent Yusuf. This article is Ideological Freeware. The author grants permission for its reproduction and redistribution by private individuals on condition that the author and source of the article are clearly shown, no charge is made, and the whole article is reproduced intact, including this notice.